Mister deejay, rewind and come again…won’t you please play that one more time? In the case of Korean All-Star pitcher Dae-Sung Koo, getting an encore performance this season in the recently revamped Australian Baseball League (ABL) after being named 2010-11 Reliever of the Year award winner during the league’s inaugural year under the leadership of ABL Chief Executive Officer Peter Wermuth is enough excitement to drive fans cuc-Koo! In Saturday’s tenth inning of the doubleheader nightcap game between Koo’s Sydney Blue Sox and scorching undefeated Perth Heat at Blacktown International Sportspark, the famed New York Mets pitching hero–who gained notoriety in the nationally televised Mets/Yankees Subway Series in June 2005 when Black Eyed Peas “My Humps” was blowing up the charts–was sent a gyration to take those dusty old phonograph records off the shelf and replace them with a new record for the longest winning streak in ABL history (ten straight) to the beat of the ipod shuffling Heat. 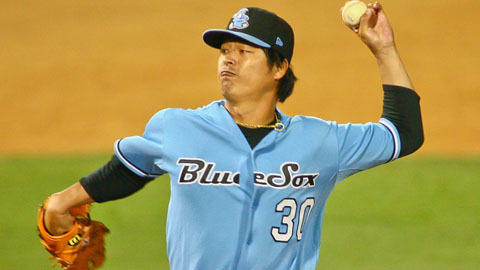 With the game tied 2-2 in the top of the ninth inning, Blue Sox manager Kevin Boles (also 2011 Double-A Eastern League Boston Red Sox affiliate Portland Sea Dogs manager) opted to call out to the bullpen and bring in Sydney closer Dae-Sung Koo to stop the visiting Heat’s offensive sting. Proving to be a sound defensive strategy, the always dependable reliever successfully Koo-led down Perth’s bats with a low pitch count so that he could once again return in extra innings if necessary. When Sydney could not put up a run in the bottom of the ninth for a walk-off victory, it was Koo to the res-Koo in the tenth…or was it? In the top of the tenth inning, the Blue Sox defense collapsed with two ensuing errors costing the game for losing pitcher Dae-Sung Koo (0-1). The relentless Heat’s Alex Burg, Allan de San Miguel, and Mitch Graham took advantage of the opportunities and delivered clutch base hits to assemble a comfortable 5-2 lead going into the Sydney’s bottom of the inning. The Red Sox answered with one run, but that was not enough as they faltered in the end 5-3. One must remember that there are nine players on the field, and everyone counts in the competitive game of baseball. Although Koo is an international superhero and on many different levels the consummate mentor for the slew of talented ABL players aspiring to make their way to Major League Baseball, the 42-year-old legend cannot carry a team. At the end of the day, this was only one game of perhaps several hundred that these up-and-coming baseball prospects will play during the course of their careers. 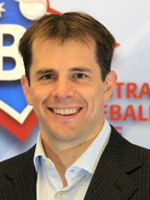 However, the gateway these young hopefuls have chosen to get into MLB via the ABL is undeniably the best path. I didn’t even know they played baseball in Australia. Where were they 25 years ago when I needed a career? I will have to keep abreast of the situation and the standings down under!